About the only thing that stopped Tattnall Square Tuesday night in the Georgia High School Association Class 1A Private state championship series was a brief thunderstorm in between a doubleheader with Prince Avenue Christian. After the Trojans rolled to an 11-0, six-inning victory in Game 1 of the best-of-three series, rain and thunder threatened to postpone the second game at Mercer University's OrthoGeorgia Park at Claude Smith Field. 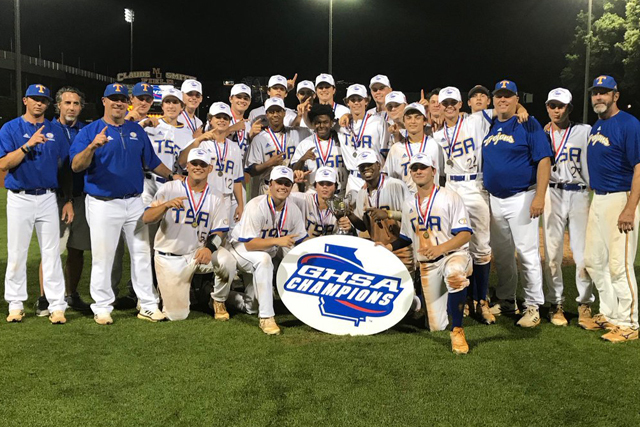 But Tattnall used a dominant pitching performance from Brooks Gorman and timely hitting and captured a 5-2 victory in the nightcap to sweep the championship series, Tattnall Square's second state title in three seasons. The Trojans won the Class 1A Private title in 2016, then finished as the state runner-up to Savannah Christian. On Tuesday night while playing in front of largely pro-Tattnall crowd, the Trojans flexed their muscles. Before Prince Avenue pushed two runs across the plate in the third inning of Game 2, Tattnall pitcher's Luke Laskey and Gorman had combined to throw 15 consecutive scoreless innings dating back to the sixth inning of the Game 1 victory over First Presbyterian Day in the state semifinals. The Trojans' offense had a hand in making things easy for their pitching staff. In Game 1, Tattnall scored 11 runs on 12 hits with Kendall Logan Simmons, Gorman, Austin Marchman and Trey Ham collecting two hits each to lead the attack. Tattnall broke the scoreless tie in the fifth inning on an RBI groundout from BJ Spears, then they scored 10 runs during the sicth inning. In Game 2, Tattnall scored a run in the first, then added two more in the second and third innings to take control. With Gorman in complete command, that was all the Trojans needed. The sophomore allowed just two earned runs on six hits and struck out five to earn the complete game victory. Prince scored its only two runs of the series in the top of the third to cut Tattnall's lead to 3-2 on Luke McDevitt's RBI double and an RBI single from Thomas Ross. Tattnall Square (33-4) has not lost before the state semifinals since joing the GHSA four years ago. Prince Avenue Christian, making its first appearance in the state championship series, ends its season at 24-12.